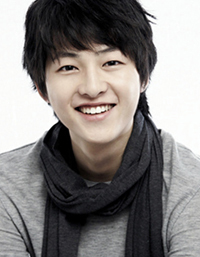 Song Joong Ki was born on September 19, 1985. He spent his early years in the rural outskirts of Daejeon. As a youth, Song competed in short track speed skating, even representing Daejeon at the national level, but a leg injury in his first year of high school forced him quit the sport. In high school Song excelled at his studies, impressing classmates and teachers alike; Song scored 380 points out of 400 on his national college entrance test. During this same time, he was scouted by a talent scout in a subway, but he decided not to get involved in the world of entertainment at that moment; he was unsure about what he wanted to do in his life and considered himself of little talent due to his insecurity and shyness. There was another obstacle within his own family; his father found out about Song being scouted and disapproved of him becoming an actor. Because of this, Song devoted himself to his university studies only, and in his free time, he only did part-time work. Song eventually graduated from Sungkyunkwan University in 2012 with a degree in Business Administration and a minor in Broadcasting. After getting his college degree, Song decided to try his luck in the entertainment business. His parents were, at this point, supportive of his ever-growing passion and interest in showbiz. Hobbies: Watching American and Japanese TV shows. He completed his compulsory military service from 27 August 2013 to 26 May 2015. He co-authored the book "Beautiful Skin Project for Men" with beauty editor Hwan Min Young; the book became a No.1 bestseller in 2010. This page was last edited on 13 April 2019, at 10:19.